Introducing... Ronald Reagan Live! Listen to live radio broadcast recordings of former President Ronald Reagan at his political best. Spanning several historical decades, Reagan's 1,000+ radio deliveries offered commentary on the spectrum of domestic, national, and international events that occurred throughout his lifetime, both prior to and during his unprecedented three-term presidency. 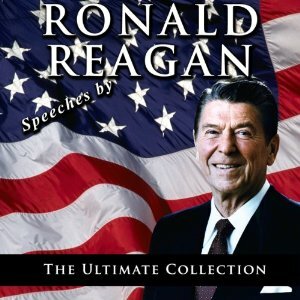 This one-of-a-kind archive of Reagan speeches will walk you down a political memory lane including debates, inaugural speeches, State of the Union addresses, domestic legislation discourses, holiday homilies, security sermons, personal commentary, and much, much more, culminating in Reagan's Republican National Convention and radio farewell addresses. These historic speeches, are a must-hear, must-buy item for anyone interested in American history and American political greats. Masterfully delivered by a man who has become a legend in his own right, you will be swept away by the profound insights and philosophies encapsulated in the Ronald Reagan speeches.